On July 19, 2006 the New Jersey State Board of Education adopted the Phase 4.5 Amendments to the Professional Licensure and Standards Code. The business education endorsement titles have been updated. Each endorsement has been delineated to specify exactly what the holder of each endorsement may teach. Reciprocity will be a part of the Phase 5 Amendments. Follow the links below for additional information. 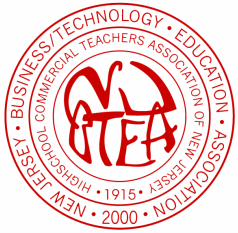 NJBTEA has partnered with the New Jersey Department of Education to offer a keyboarding proficiency examination that candidates may take to fulfill the requirements for a variety of business education endorsements. Candidates may contact any testing site for more information and to schedule an appointment to take the examination. Adopted December 6, 2007. Effective January 7, 2008. Scroll down to page 113 (6A:9-9.2(a)9i) to view the delineated business education endorsements. On December 1, 2008, New Jersey Commissioner of Education Lucille E. Davy confirmed that many business business education teachers are highly qualified to teach economics. On May 21, 2009, New Jersey Commissioner of Education Lucille E. Davy clarified several of our concerns about the new graduation requirement, including implementation and certification. The Department's intent in this guidance is to support district implementation of this requirement by providing options that allow for flexibility in instruction.